For those interested in open-source systems (everything from public policy to software) should listen to Christopher Allen’s talk (his blog here) on the Dunbar Number. Malcolm Gladwell brought the Dunbar number into popular discourse when he referenced it in his book The Tipping Point. However, Allen’s talk tries to nuance the debate. Specifically, he wishes that those who reference the Dunbar number would be more aware that in he research literature, the mean group size of 150 only applies to groups with high incentives to stay together. As examples he cites nomadic tribes, armies, terrorist organizations, mafias, etc… in short, groups in which mutual trust and strong relationships are essential for survival. This is in part due to the fact that there is a cost group members must pay to maintaining this groups of this size: one must spend 40% of ones time engaged in “social grooming.” This means sitting around listening to one another, talking, being engaged, etc… Without this social grooming it is difficult to develop and maintain the unstructured trust that holds the group together. 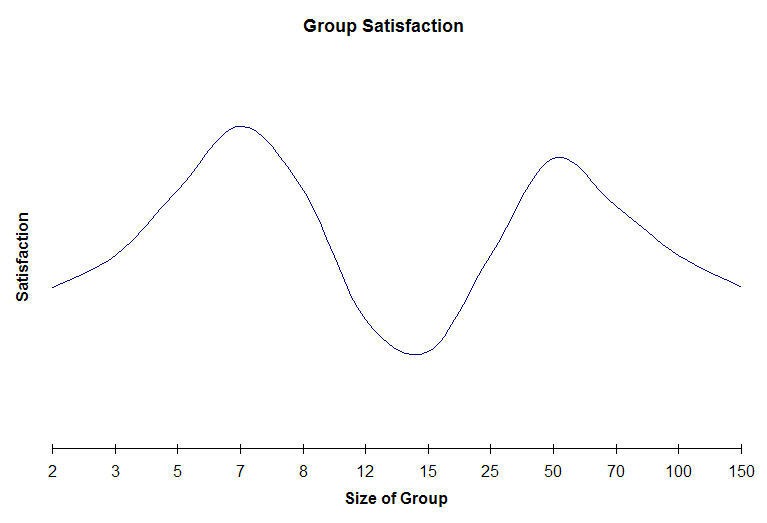 More interestingly Allen’s research suggests that in modern groups there is a correlation between group satisfaction and the size of the group. Things work well between 3-12 people and from 25-80. But in between there is this hole. Groups in this “chasm” are too be too big to use many of the tools (like meetings) that small groups can use, but too small to successfully rely on the tools (such as hierarchies and reporting mechanisms) that allow larger groups to function. Open source projects (and really any new project) should find this interesting. There is a group size chasm that must, at some point, be crossed. When I’m less tired I will try to wander over to sourceforge and see if I can plot the size of the projects there to see if they scale up nicely against Allen’s graph. This entry was posted in open source, technology and tagged dunbar number, Malcolm Gladwell, open source, open source software, open source systems, social relationship, technology, tipping point on October 29, 2007 by David Eaves. very interesting stuff. i wonder how this relates to online fora (yes, fora. i am on a one-man mission to re-introduce latin plurals into everyday speech). it is very evident at simple social gatherings, even. I think the primary source of the chasm is likely caused by a breakdown in assignment of responsibility. In the smaller sizes it’s easy to know the responsibilities of all the members. In larger groups there is a more structure hierarchal power dynamic, and those at the top are responsible for those underneath them. When you have this middle structure that can’t take advantage of either property, you get a break down in traceability. Fred Brooks talks about this very concept in the Mytnical Man-Month and says very much the same thing, only much more intelligently and with far more credibility. It’s interesting that you point this out. I had similar feelings about the same thing: http://jeremyvernon.com/2007/04/03/social-netwo…I think the primary source of the chasm is likely caused by a breakdown in assignment of responsibility. In the smaller sizes it’s easy to know the responsibilities of all the members. In larger groups there is a more structure hierarchal power dynamic, and those at the top are responsible for those underneath them.When you have this middle structure that can’t take advantage of either property, you get a break down in traceability.Fred Brooks talks about this very concept in the Mytnical Man-Month and says very much the same thing, only much more intelligently and with far more credibility. Finding this 2007 blog post for the first time… have you read Robin Dunbar’s book “How many friends can one person have?” He talks about how the dynamics of groups change as they grow, and how we have circles of intimacy that go up roughly by factors of 3 – he talks about the “circle of 5”, “circle of 15”, “circle of 50” and “circle of 150”. What you notice is that as groups grow above the limits, you have a tendency to see sub-groups form (so 8 people will make a group of 5 and a group of 3, or two groups of 4). And this results in sub-groups closing off to the other sub-groups – the nature of relationships in a group of 15 is different to a group of 5. If you look at sports teams, the trainers will often try to break the team into constructive subgroups, as opposed to allowing “cliques” form within the team – so you have the group of forwards and backs, rather than the A team and the B team; you consciously ensure that the “stars” are not just hanging out with other stars, and have them be a positive influence on the less skilled players; in a company, you can ensure that there is communication between teams by organising vertical communities of practice (“the designers”, “the UX guys”, “the testers”) as well as horizontal project-based communities (where you have a designer, coders, testers, manager and marketer working together). Anyway, fascinating topic, and definitely one relevant to open source.